For recommendations to clients and regulators, the AIRAH Special Technical Group in Building Physics has recommended that results are expressed in terms of air permeability of a building envelope – that is, for every square metre of surface area of the building, how much air leaks through it? Typical terms of expression are cubic meters per hour of air leakage for every square metre of envelope (floor, ceiling, and walls), sometimes expressed as qE50 or m3/hr·m2. A level being discussed for the National Construction Code someday is 10m3/hr·m2 @50Pa. Another air leakage metric commonly cited for houses is “air changes” per hour at 50 Pascals (denoted as n50 or ACH50). That is what Passive House currently uses. To explain, under a certain pressure, how many times per hour does all the air leak out of a building? It’s really a very similar concept. 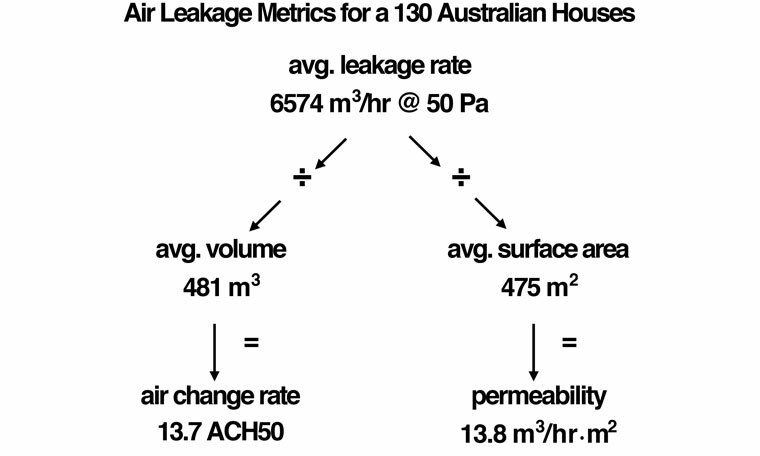 Permeability is air leakage (m3/hr) divided by surface area (m2) of a house; air change rate is air leakage (m3/hr) divided by volume (m3) of a house. One thing to keep in mind is that for most houses, by coincidence, the surface area and the volume are fairly equal. Just to drive this point home, I took the average test result of 130 Australian homes that had blower door tests done, then divided it by the average volume and average surface area. The numbers are almost the same. On average, 13.7 ACH50 air change rate almost equals 13.8 m3/hr·m2 permeability. No big difference. Now try to do the same thing with commercial buildings and you’ll see that surface area and volume very quickly diverge. Let’s not over-complicate the reason why: surface area grows by the square of a building dimension; volume grows by the cube. A common commercial building may have six times more volume than surface area. This is not because of the building’s shape; it’s just because it’s bigger. If you take the average house and double it in size, the surface area grows by four times but the volume increases by eight times. Therefore the bigger you build, the easier it is to meet an air tightness metric based on volume like ACH50 because the divisor of that figure gets bigger much faster. ACH50 might make sense for a typical small house but not for anything else. There are some who cling to the idea that if it’s the building air volume that must be heated to keep a house warm, why not make a standard based on volume? Well, technically that is wrong. It is not the building volume that must be heated; it is the air leakage. Once the building volume is heated, it only needs to be heated again if it loses heat by conduction to the exterior surface, or if air leaks out and is replaced by new air from outside. It is only the new air that needs to be heated. A thought experiment will show what I’m talking about. Let’s do a blower door test on a hypothetical house. We get a result of 1000m3/hr @50Pa. Now imagine I inflate a huge balloon in the house and we test again. What would the result be? We would still get 1000 m3/hr because the leakage rate is related to the surface area, not the volume. Whether some of the volume is occupied by me, the tester, furniture, or a huge balloon doesn’t matter. All the test standards say not to make exclusions for furniture inside during the test, and I used to think that was for the sake of simplicity, but then I realised it’s simply because it doesn’t matter at all. Now translate the blower door test into building physics. A leakage rate is due to two main things: the area of a leak and the pressure behind it. That’s why if I have three containers of water – one skinny, one mid-size, and one fat – a hole drilled at the same height in each would yield the same flow. That’s because it doesn’t matter how much volume of water is in the containers – just the height of the water, because that’s what creates the pressure. One could argue with this diagram that the height of the water level would fall faster in the small container B with smaller volume, and this is true. 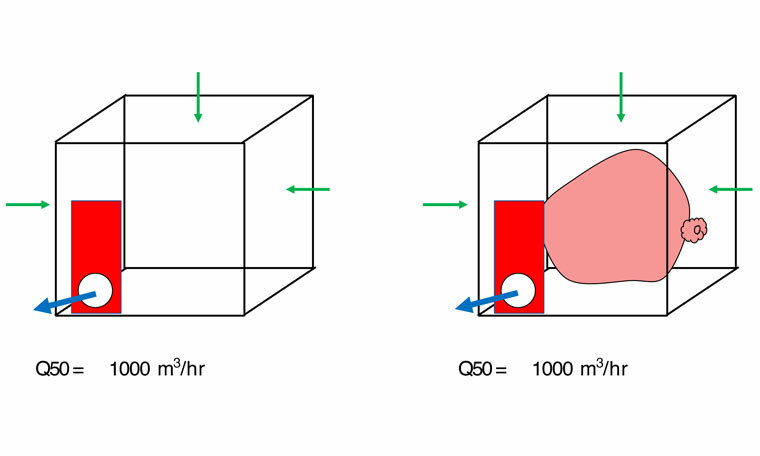 That would mean that the pressure, and therefore the flow, would decrease faster in the small container B than the large one C. But the driving force behind stack effect (air buoyancy) is differences in air density, and that is a result of temperature differences, which in a real building are held as close to constant as possible. The only way to improve this diagram would be to say that there is a fresh water tap at the top to keep the water level constant. Then the pressure and the flow through the hole in any of the containers would be constant. This is more like a building where the temperature, and therefore stack effect, is held constant. One could also argue another important point about the above diagram. Because the little container has not much volume, a large fraction of its volume is lost from a single leak. The same would be true for a house. A house with a lot of surface area and not much volume would have a lot of air changes (leakage per unit volume) and that equates to a lot of energy use per unit of living space. I don’t disagree. It’s true; more surface area means more heat loss. 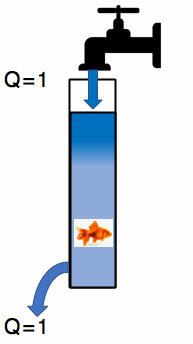 The surface area of container B is almost the same as the surface area of container A, but a goldfish swimming in container B would get colder faster because there are more water changes per hour. Still, the total amount of energy that a water heater uses to keep the water warm will be the same in any of the containers if given the same leakage rate (Q = 1). The heating energy for water in the container, just like heating energy due to air leakage in a house, is related to the flow in and out, not the static volume. It’s true that minimising surface area per unit of living space is a winning energy conservation strategy. I totally agree. If we could all live in spheres, we could maximise living space volume and minimise surface area. Easy. But thankfully we don’t live on the moon. That commentary belongs in a different place. Testing a building envelope for air tightness is like inspecting a wall for insulation. If my job is to simply assess the quality of the job, it is not my position to comment on whether the architect used too many walls in their design. It is only to evaluate the workmanship. What we are concerned with is, given any design, how well has it been executed? Requiring a surface permeability standard is more sensible and is similar in some ways to requiring a given level of insulation. A minimum thickness of insulation is required to reduce heat loss per square metre of surface area. How much surface area a design includes will have an impact on energy use – more surface area means more heat loss and more energy use – but that decision is ultimately up to the designer. One argument for a volume-based metric I hear is that it’s simpler to calculate or to explain. For a simple house, it is super quick: just trace the floor area on a set of plans, then multiply by the wall height to get the volume. Easy. But the process of tracing the floor outline for area is the exact same process for tracing the floor outline for wall perimeter and area. It takes about five minutes for a simple house, either way. For those who continue to argue that volume is a simpler calculation, I would expect that they have never tried to calculate anything other than a simple building with a flat ceiling. Let’s think beyond for a moment. What if there is a slightly more complicated roof like a cathedral ceiling? Is calculating volume still easy then? For a little brain teaser, calculate the surface area of the highlighted blue roof shape in the right figure below. Now calculate the volume. Which was easier? Many readers would have trouble doing either. 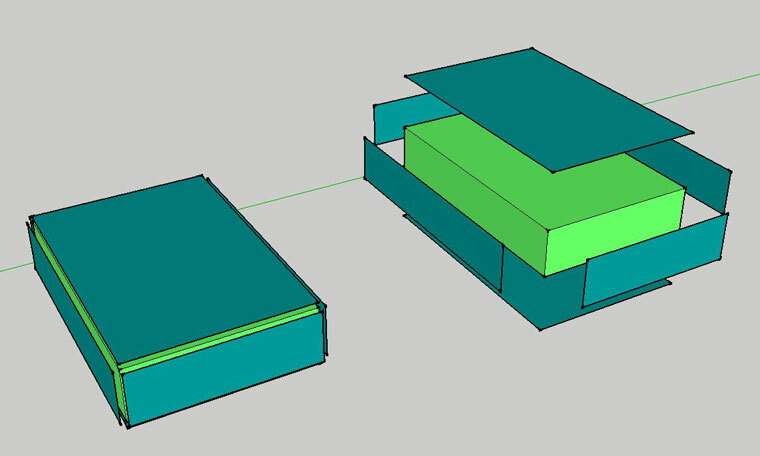 I have to say that using Google SketchUp, a free software tool, makes calculating either surface area or volume a non-issue. Furthermore, for anything more geometrically complicated than a simple house, neither the calculation of volume nor surface area is always easy. Look below at this SketchUp model of a high-rise office building that wanted an air tightness test. Calculating the volume would have been just as difficult as the surface area, were it not for SketchUp. Finally, the designers and assessors of buildings are often required to calculate surface areas already. For example, NatHERS assessors are required to calculate the surface areas of a house anyway – these are the areas of insulated walls and ceilings that go into the energy models. It should be possible to coordinate the two efforts to quickly arrive at a useable number for a blower door test, possibly without adding any work at all. To review, air tightness requirements should be based on surface permeability – walls, floor, and ceiling area – and not volume. For houses, there is very little difference between the two metrics anyway, but for large buildings, only permeability makes sense. Building physics and energy use only depend on permeability, not volume. There is little difference in the complexity of calculating either measure. And after all, at its most glorious, blower door testing is simply basic envelope commissioning. How is a building envelope constructed? With surfaces. How do you make sure those surfaces are well sealed? You test them. Sean Maxwell is president of the Air Infiltration and Ventilation Association of Australia. He is also deputy chair of the AIRAH Special Technical Group in Building Physics, and works for Pro Clima Australia, a maker of air tightness products. Sean, great article thank you. Hopefully it will dispel the myth that airtight homes end up smothering people. We are so used to building colanders in this country that the thought of air tightness frightens the average person. The belief that PassivHaus is only appropriate for mid European climates is just wrong. Heat does not discriminate which direction it moves in. Keep up the good work. Having just replaced all my sash windows and Australian doors with European standard double glazing units I have found a major benefit has been the air-tightness. Absolutely agree and have been making the same argument but less clearly. For Passivhaus the volume used for the n50 calculation is particularly challenging. However if we use external envelope area for our permeability calculation then we have already measured this precisely for our heat loss area. Great article, thanks. But how do you test the permeability of a surface, practically speaking? And I should add, I’m not an engineer! 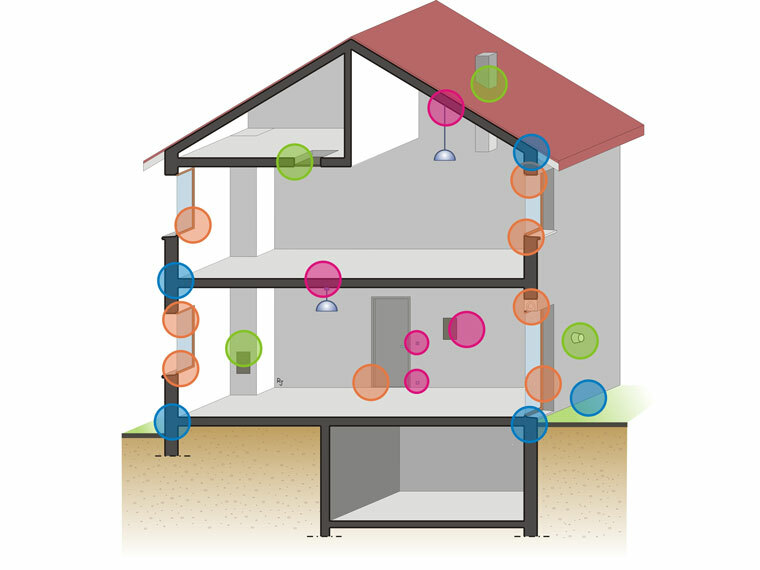 The process for calculating permeability and air change rate are exactly the same. The thing you are measuring with the blower door is the air leakage rate. Now, how you decide if that number is a good number is by using some basis for comparison. Divide leakage rate by volume and you get the air change rate, n50. Divide by surface area and you get permeability, qE50. So testing the permeability of a surface is that simplistic: induce pressure across the surface, measure the leakage, then normalise the leakage by the surface area. Irregular area calculations from images are made simpler by nominating a known length (such as a doorway, window, wall or any building component) to set the drawing canvas scale in SketchAndCalc™. Once set, multiple area calculations can be performed over the same plan by drawing out the irregular areas involved in the airtightness test.